The Quadratec Folding Receiver Hitch 4 Bike Rack is designed to clear the rear spare tire without the need of a hitch extension and work with any 2 receiver. 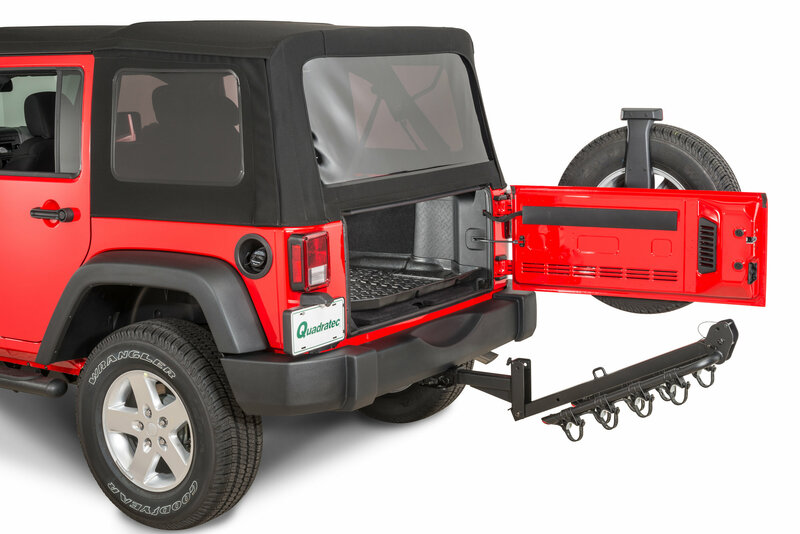 The handy tilt back feature allows the tailgate and liftgate to open for easy access to your cargo area without having to remove the rack. 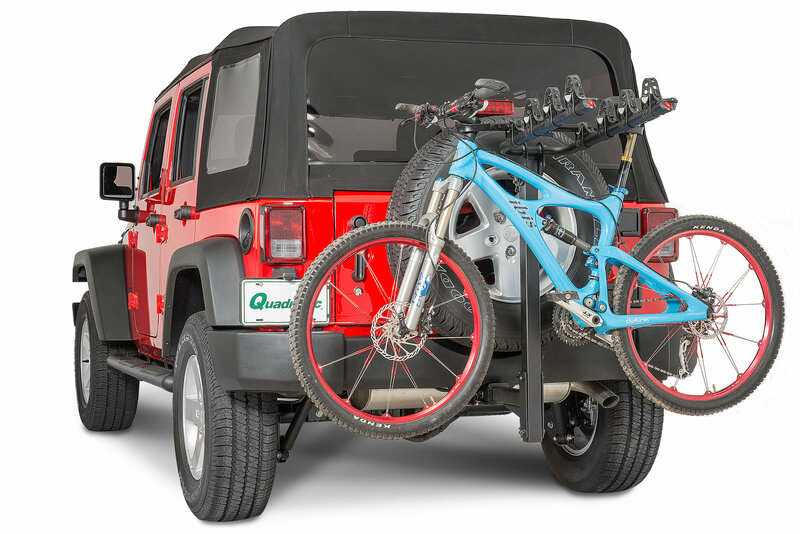 The 4 bike rack holds up to four bikes with a combined weight of 140 lbs. The soft rubberized cradles and the adjustable rubber hold down straps firmly secure bikes without marring their finish. The dual arm supports provide extra stability and have red safety reflectors and fold down for compact storage when not in use. 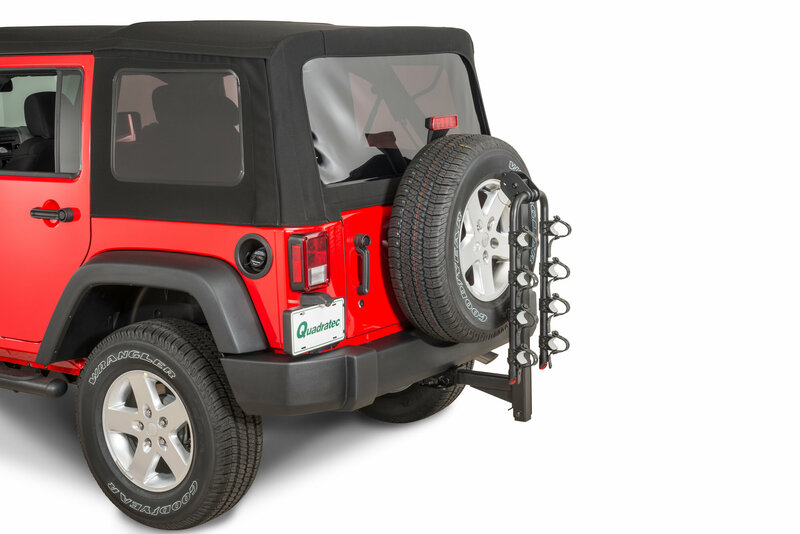 System includes a 9 long adjustable nylon cinch strap for additional security when transporting bikes. Thick welded steel construction with black powder coat finish provide lasting durability. Includes a three year limited warranty. Works well as advertised on my 2009 4-door Sahara with back up camera. Obstruction of back-up camera’s view is acceptable/manageable, and I can ignore the constant beeping alarm when backing up. The only reason I am withholding the final star from 5-star is that I wish they were able to make the system a “parallelogram”. 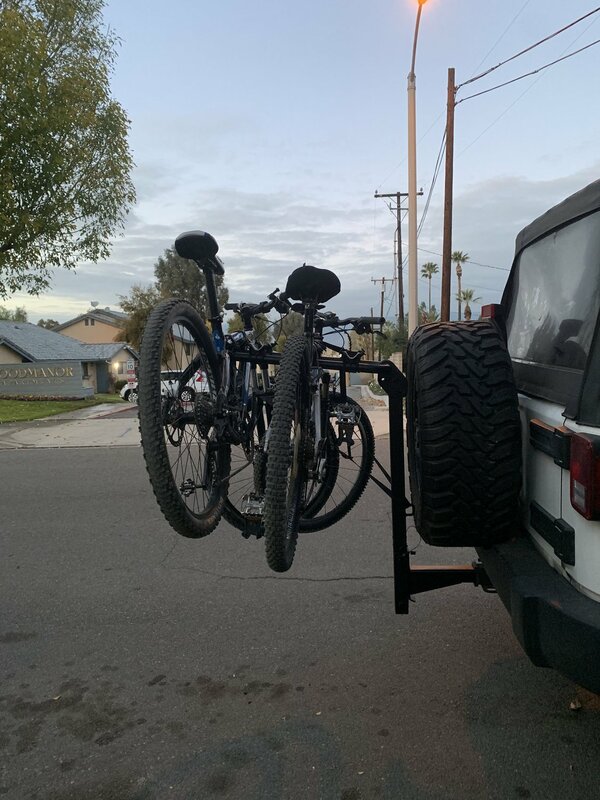 That way, you could lower the rack with loaded bikes for tailgate access, while the bikes land perpendicularly on the ground while still loaded (as opposed to hitting the ground in an angle). 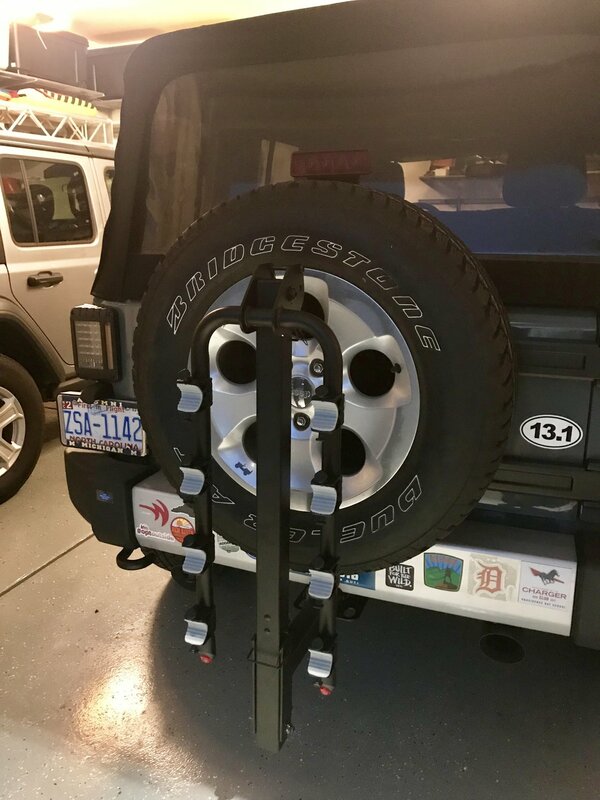 After searching and researching hitch mounted bike racks for several weeks I was resigned to spending $500 for a 3 star user rated rack from one of a variety of bike shops, outdoor retailers and sporting good companies. Not sure why it took me so long to land at Quadratec but boy am I glad I did! This rack is SOLID. It took me under 30 minutes to unpack and install. Love how the matte black finish looks with the rest of my accessories. When lowered the gate swings all the way open with full clearance. But most importantly three things. 1-that the rack arms are not too wide. My last wheel mounted rack was so wide, kids bikes wouldn’t fit on it. Great call on the dimensions. 2-that the bike cradles can move around the arms and up and down the arms. No more cramming bikes so close to each other they bump and scrape against each other. 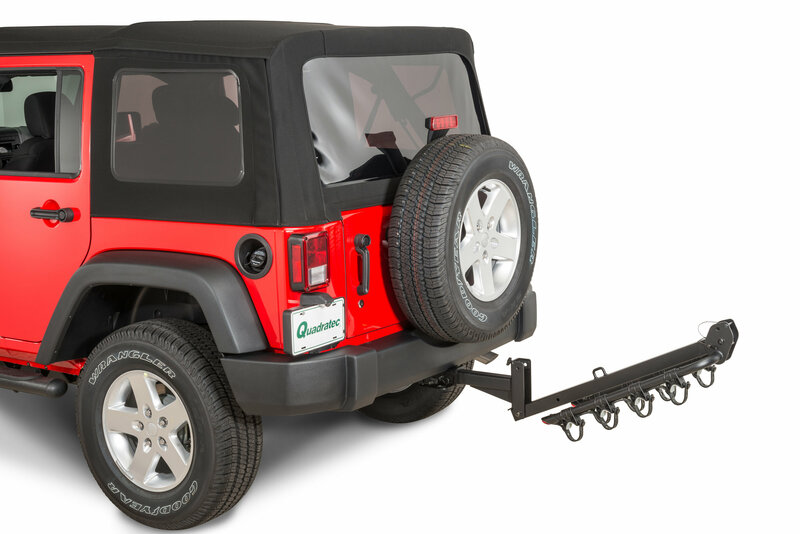 3-we’ve all suffered the bike rack that wobbles like a bobblehead on your dash. When properly installed this thing is an extension of the vehicle frame it seems. 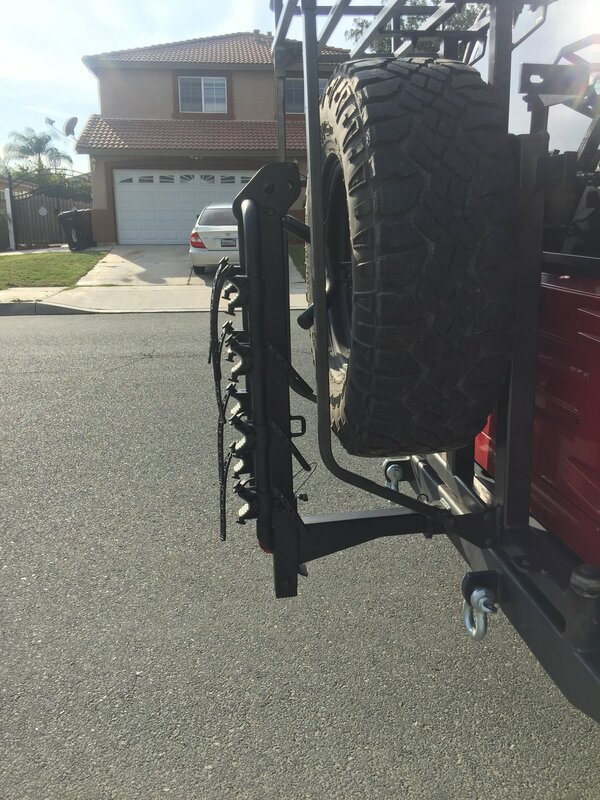 Try to move the rack and watch your vehicle bounce up and down. Amazing! 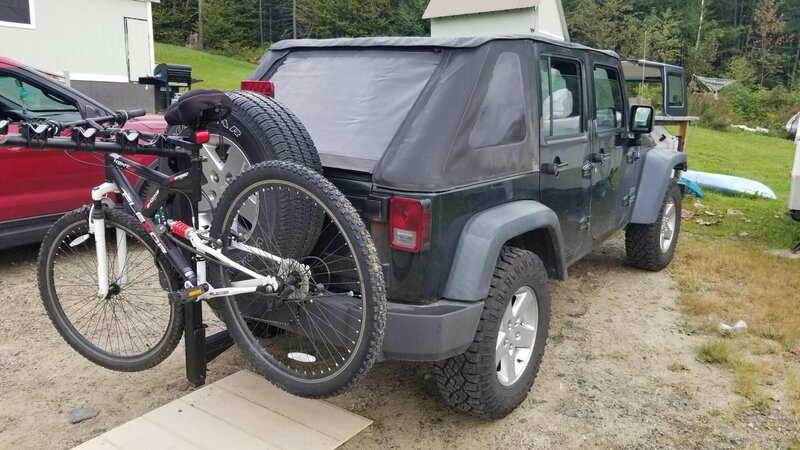 For under $150 delivered this has to be the best constructed, most thoughtfully designed, highest quality bike rack on the market. I Love this product, I can swing my rear gate wide open after allowing rack to drop away. My only request I would like to be able to purchase the two bike head and I could bolt the four or two bike head on and off as needed. Otherwise this is an AWESOME Product. it holds the Bikes SOLID and in place. 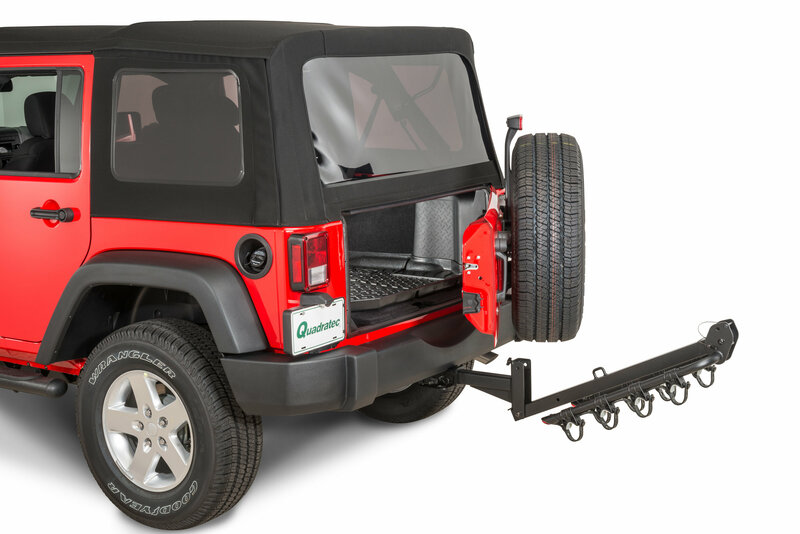 What’s the distance from center of the hitch pin hole to the upright bar (so we know if it will clear spare with non-stock wheel and tire)? There are two hitch holes on the mount. The distance from the first hole to the bike rack upright post is 13-1/8". The distance form the second hole is 12-1/4". 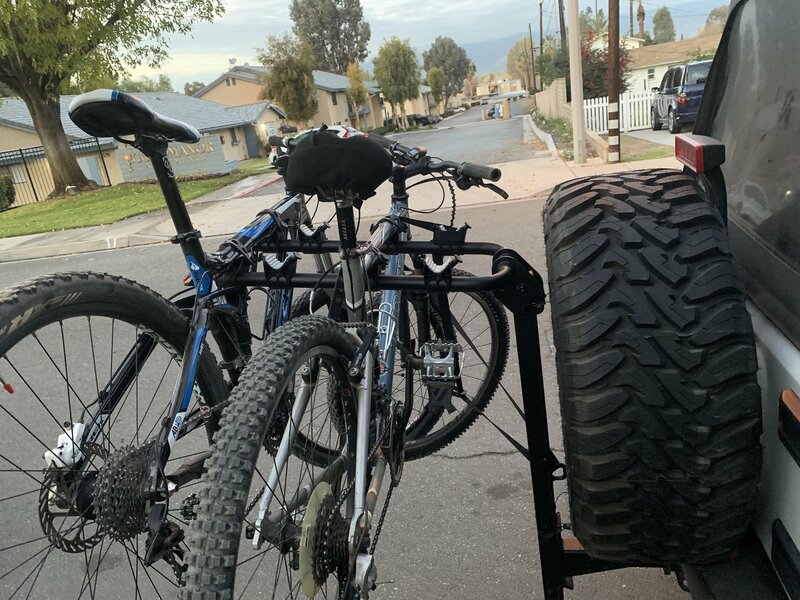 I only need this for 2 bikes, however they have saddle type wire baskets on each side of the rear wheels and in front of the handlebars and fishing rod holders, ( cape cod bikes). Can I keep the bikes spaced apart to transport them without removing the baskets? Will the Quadratec bike rack hitch 4 bike work on a 2018 wrangler JL with 33in spare tire?